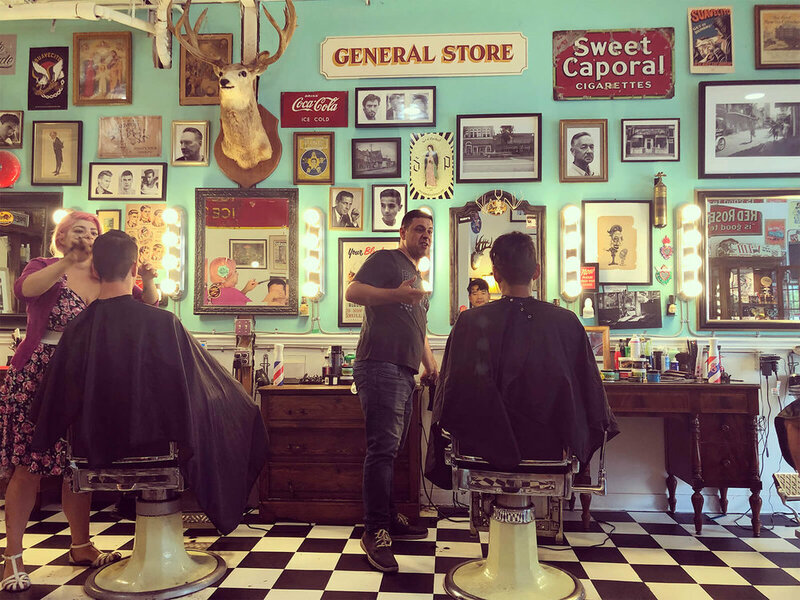 Billie’s is a gathering place not only to get a haircut, but also to engage in friendly banter, have a laugh, trade gossip and maybe make new friends. A relaxed and friendly environment comes with a great cut every visit, a vintage place for the modern man… or kid. We respect the heritage of classic barbering, this tradition of barbering craft thrives at Billie’s. Come in and experience the time-honoured ritual of a hang out, casual haircut and/or shave. Come after work or come on your way to your own wedding….your appointment is when you walk in the door. We offer a full-range of hair care services for all including haircuts, buzz cuts, color, hair designs and beard trims. Vintage music, collectables and antiques on display to dazzle your mind while waiting! Took my 1.5 year old for his first ever haircut and he was less than cooperative but the staff were absolutely AMAZING and were goofing around with him. Despite his monkey business, he came out looking rather dapper and I didn't cry like I said I would LOL. Will definitely be return customers, you guys rock!! Looked for a local barbershop in my town and this one popped up with high Facebook ratings. Gave it a shot, had John as a barber and it was one of the very best haircuts I have ever gotten. Laid back atmosphere, great conversation, attention to detail. Happy to be a new client of his now. I’d say this is the best shop in Delta to get a cut, but in reality it’s the best place period. I’ve gone to some of the so called higher end shops in Vancouver and nothing compares to Billies. I will not get my haircut anywhere else! The atmosphere, the decor, the products, most importantly the people are all top quality. Unconditionally recommend this place.